Chunghwa Telecom (CHT) in Taiwan is aggressively developing and implementing a cloud business model with the vision of becoming a global ICT leader with its convergence technology. In particular, Infrastructure As A Service (IaaS) is one of the key offerings of CHT cloud businesses. Their business will require a high density compute infrastructure and mandates a high efficiency containerized ...datacenter. 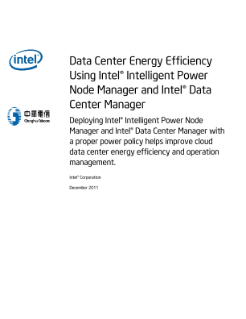 In this Proof of Concept (POC), CHT and Intel partnered to investigate the use of Intel‟s power management technologies known as Intel® Intelligent Power Node Manager and Intel® Data Center Manager. The POC was conducted in CHT‟s existing datacenter with the goal of making CHT‟s future cloud datacenter more energy efficient, highly available, and with increased server density.